Looks good Aaron. For thicknessing scales try making a board with a couple of stick glued to it at your desired finish thickness plus the thickness of a sheet of sand paper, then glue some sandpaper to a flat piece of wood, I like to use spray adhesive. Put your scales in between the two pieces glued to your board then put your pice of wood with the sand paper glued to the top of that and go to town. I get the show faces done first then just use the jig to sand out the inside faces. Mdf works well as a substrate as its pretty flat and stable. ScoutHikerDad, Geezer, sharptonn and 1 others like this. 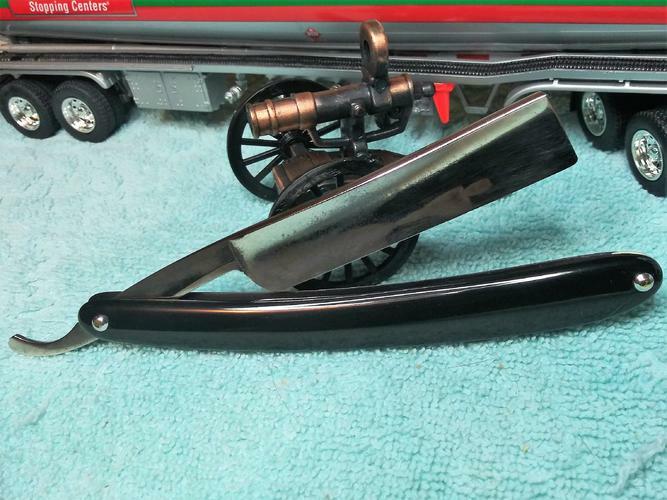 Well gents, after spending most of the winter restoring Aladdin lamps to get Tom lit up, I finally got a razor to work on. One of my divorcees presented this little gem to me today. 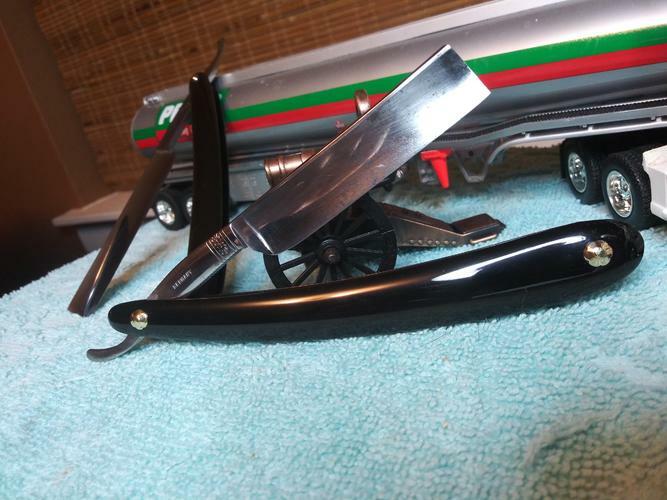 My first razor with a covered tang. It's a McDonald's Choice made by H. Boker. All it needed was a polish with Mother's and a trip to the hones/strops. 800 bevel set, 1200 bevel refinement, 4000 Norton, 8000 Norton with slurry, translucent Arkansas finisher, 25 laps with Crox, 25 laps linen, 25 laps leaded linen, 50 laps SRD Premium 1, and 50 laps Illinois 6454. 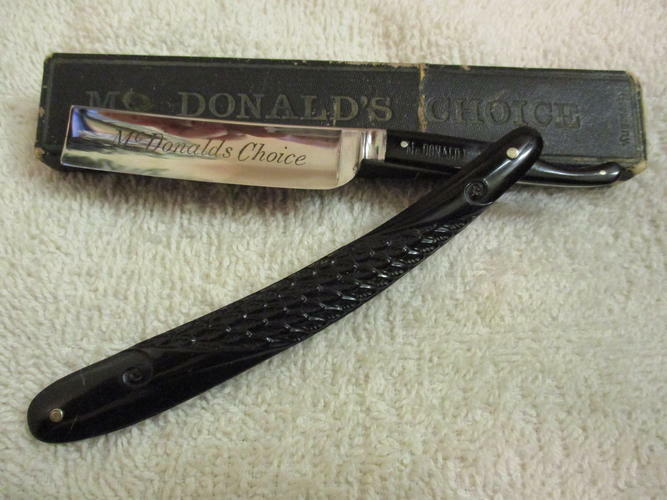 Tuesday or Wednesday I'll see if I get a Happy Meal.....I mean Happy Shave with the McDonalds. ScoutHikerDad, cudarunner, sharptonn and 10 others like this. Seems like more common with a pearl tang and yellow scales in that pattern. The black on black looks smart! Oh! Still just the one Aladdin lamp. jfk742 and outback like this. It's about time you rub that lamp with a match Tom and see if a genie pops out. ScoutHikerDad, sharptonn and jfk742 like this. Handsome razor Benz! If a little polish got it looking like that then it must have been taken care of. Love the tang/scale combo. ScoutHikerDad, MikeT and Benz like this. After the honey-do list during the day and taking her out to dinner, I got some time to do some sanding on the scales and got these two pinned up. 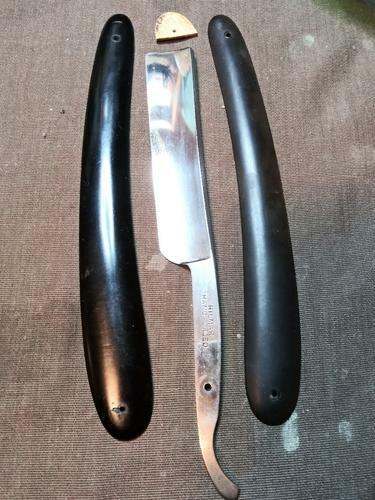 Both Full Hollow, 11/16, German, Vulcanized Rubber Scales and spike points. 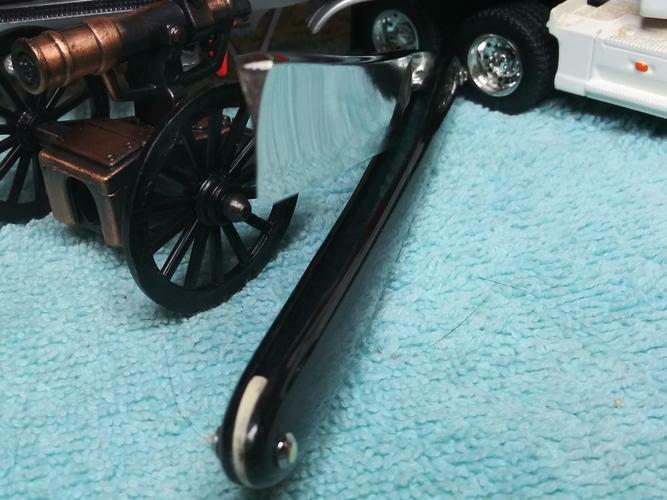 Both blades have some hone wear and pitting that I wasn't able to get out. #1: The Hilmar Hand Forged had no scales, so I dug thru my Scales box and came up with 2 that were close as far as pin holes, but the shapes were different. So they were going to need reshaped and sanded down. Also one of the scales had faded to the ugly brown color. I dug up a white plastic wedge out of my box to go with it. After reshaping the scales and wedge to match I knew the pins would be close to the outer edge of the scales, but they are repurposed scales so you work with what you got. #2 The A. Field & CO Model 2013 had some scales that had file marks where someone had been playing with the pinheads and missed. It came with a lead wedge. After all the sanding and polishing here is what I got. 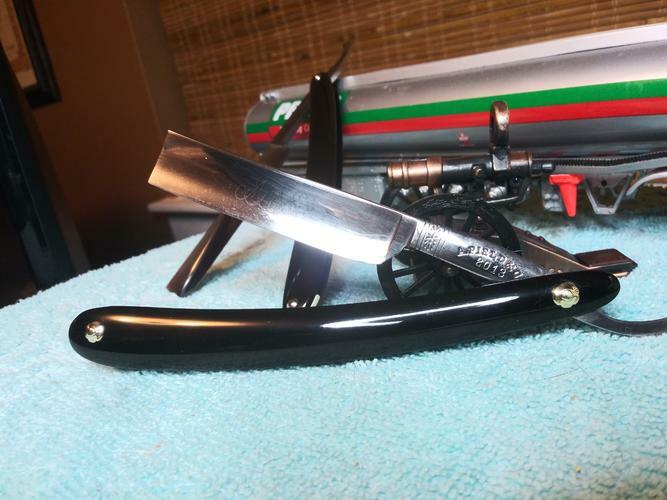 Two more razors for the Hones. There is a light etch on the blade face that says A.F. & CO. in script. 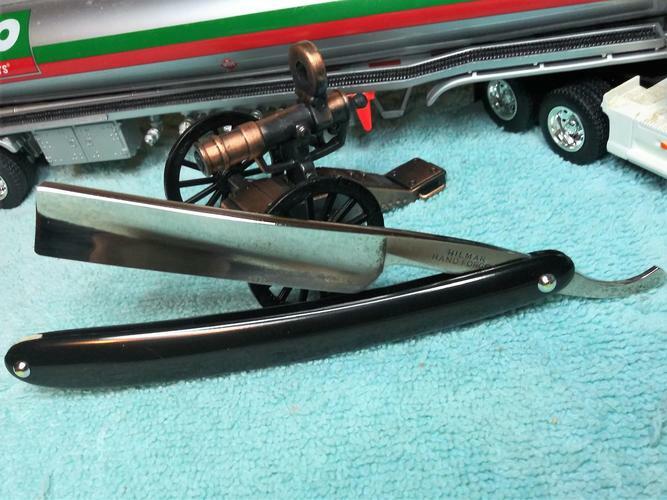 The first razor (Hilmar) Got homemade collars and silver/nic pins. The second razor (A. Field) got A.J Kenny's flower collars and Brass pins. ScoutHikerDad, cudarunner, sharptonn and 7 others like this. 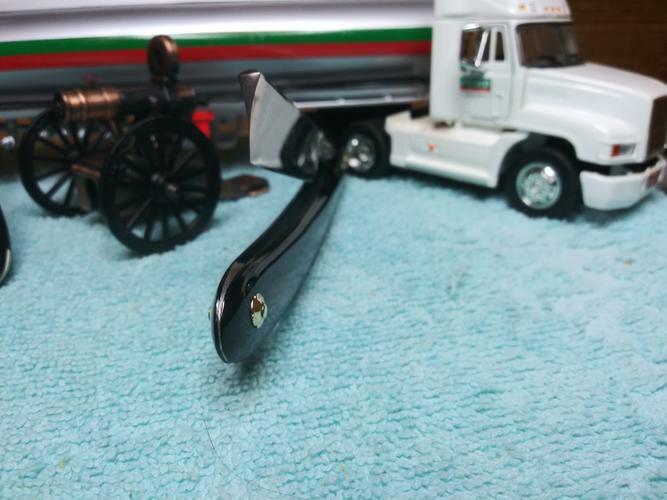 Benz-I am envious; that is a gorgeous Boker! I've gotten some of my finest edges on Bokers, for what it's worth. Their reputation is justified as you all know. cudarunner, Benz and Gasman like this. There are many roads to sharp. 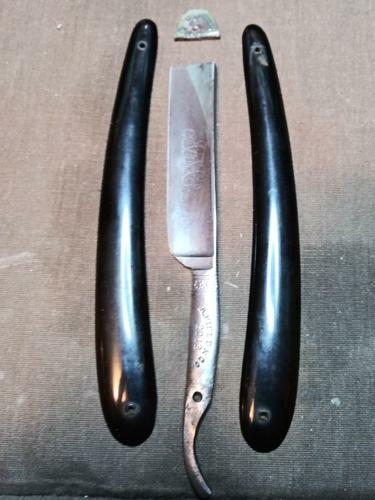 Jerry-That makes a nice pair of working man's razors. I especially like the stainless dome collars on the Hilmar. I'm sure they will come out with nice edges off of your hones-enjoy! cudarunner, sharptonn, jfk742 and 1 others like this. I agree, those collars look right at home on that razor. Last edited by jfk742; 04-16-2019 at 03:23 AM.